Here's a great intro to my newest book, Modern Quilt Magic! Happy to talk Quilts with STORY BEE! A new series for members of the Quilt Alliance, Check out my first episode with them, then go sign up to be a member! Support the Quilt Alliance. Document, preserve and share the stories of Quilts and Quilters! This is our passion! For more information visit their membership page. 2 SNACK SET ~ Variety Pack template videos, Get your templates here! My Two Newest Sizzix Dies! Diamond Sampler and Crossroads! Sizzix is a 40 year old company. Remember in elementary schools all the die cuts of letters and flowers? Ellison Corp. is the parent company... They have been doing die cutting for a long time. You can ALSO use Accuquilt dies in Sizzix machines using a "Go adapter pad" that is a shim to make up for the thinness of there die. ** You can order SIZZIX through me as well, Email me and I can send you a catalog, and we can discuss. I have some products on hand, here. A new way to look at curves!! I love the scallops this die makes! Ready for something unique! Here it is! Victoria's Curved Braid for Sizzix. Need to make a signature block quilt for Wedding Anniversary, Birthday? This die is for you! * layers at a time, means, a fast quilt with several options for layout and design! Many variations beyond a signature block! This is a very clever & fun TWIST block to make. Illusions of twisting fabric, makes for a great scrap quilt or fabulous border! My DARTS die! How fun and modern is this! two ways to use the die and have loads of fun playing in COLOR! My Geese Crossing die! I'm so addicted to to seeing how many different ways I can use this die! List the blog to see many options! and create more! My Hex Star Die- Here's your tips for learning easy Y seams! Take that fear away today! Make these beautiful Star Hex blocks! Square dance die, learning Partial seams.... Check out the amazing traditional and Modern designs! Rocking the House Die: Fast fun scrap quilts!! Bow Tie Die, Curves and fabulous options! SIZZIX MINI DWR Video, piecing and learning CURVES! Sizzix Melon Die video. How to piece curves, fun! Sizzix TULIP die, How to piece. Sizzix MINI wave die: How to piece, fun in small scale scraps! VARIATION: Sizzix WAVE die play for a whole new design using one die! Watch Victoria on Sewing With Nancy! PBS! 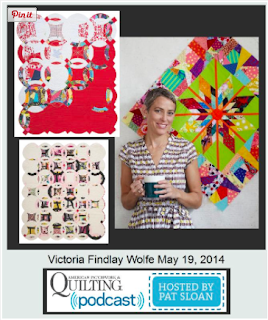 EPISODE ONE: Sewing With Nancy, Victoria Findlay Wolfe Click link. Quilt Alliance Go Tell It at the Quilt Show! Talking about my Quilt FARM GIRL at the Houston International Quilt Show. Go Tell it at the Quilt Show, 2016 Houston Int'l. Quilt Festival, Mr. Swirl E. Bones 2016. Go Tell it at the Quilt Show, 2013 Double Edged Love QuiltCon 2013. Modern Quilts Unlimited Magazine interview. August 24th, 2015. Podcast with A Crafty Planner.